The 2011 Dodge Grand Caravan. 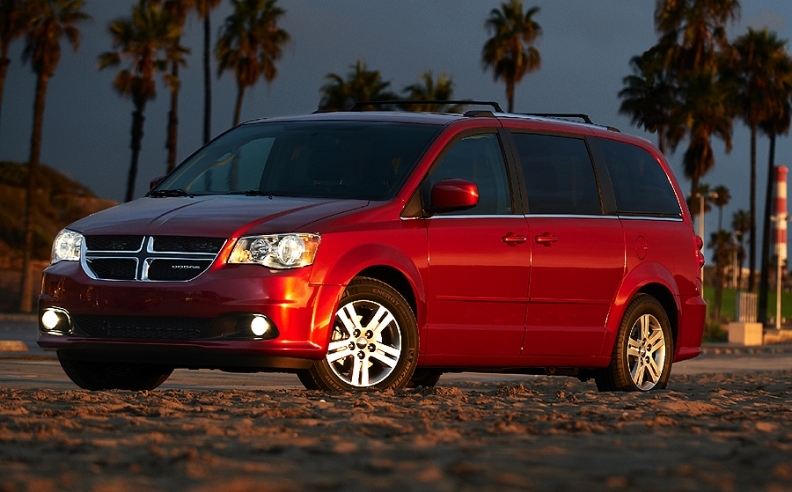 Chrysler is refreshing its entire minivan line with upgraded interiors and a new engine. CHICAGO (Bloomberg) -- Chrysler Group LLC wants to attract more men to its minivans as women eschew the segment's unsexy image in favor of sport-utility vehicles. Chrysler's Dodge Grand Caravan R/T, which the company refers to internally as the “man van” because of styling and features geared to appeal to men, will be on display tomorrow at the Chicago Auto Show. The vehicle will arrive in showrooms in the second quarter. Chrysler hasn't announced its price. Chrysler, the U.S. automaker operated by Fiat S.p.A., is refreshing its entire minivan line with upgraded interiors and a new engine. The man van is slated to have a black interior with red accent stitching, a performance-tuned suspension and a sound system with nine speakers and a 506-watt amplifier. Honda Motor Co. and Toyota Motor Corp. both released redesigned versions of their minivans last year and are working to broaden their appeal as U.S. sales in the segment slid to 460,154 last year from 1.37 million in 2000, according to researcher Autodata Corp.
A recent commercial for Honda's Odyssey shows a man leaving a grocery store at night to find his minivan encircled in flames and temporarily transforming into a black panther as Judas Priest's “The Hellion” plays. Inside the van, giant speakers blare and television screens show a rock concert and a fire- breathing monster. “I'm pretty sure we're the first to use Judas Priest to promote a minivan,” said Tom Peyton, Honda's U.S. senior manager for national advertising. With the 2011 Odyssey, Honda is addressing customers' qualms with minivans by giving the exterior more contemporary styling and providing a sportier ride and handling, he said. The companies are trying to shed minivans' “mommy-mobile” image and broaden its appeal as customers are attracted to car- based sport-utility vehicles often referred to as crossovers, said Rebecca Lindland, an analyst with Lexington, Mass.- based IHS Automotive. Sales of SUVs such as General Motor Co.'s Chevrolet Traverse, Ford Motor Co.'s Explorer and Toyota's Highlander climbed 19 percent to about 3.51 million, according to Autodata. Minivan sales rose 11 percent last year, according to the Woodcliff Lake, N.J.-based researcher. Chrysler's Town & Country was the volume leader last year, with deliveries rising 33 percent to 112,275, topping the Honda Odyssey's 8 percent gain to 108,182. The Dodge version of the minivan rose 14 percent to 103,323, according to Autodata. Honda's Odyssey in 2008 dethroned Chrysler's Dodge as the top-selling minivan brand, defeating the U.S. automaker that invented the segment with the Caravan and the Plymouth Voyager. Shawn Beauchamp, a contracting officer with the U.S. Air Force, recently bought a new Toyota Sienna minivan after looking at SUVs. The Sienna's functionality and gas mileage won out for the family with three children. He even likes the way it looks. Still, his wife will be driving the van because he doesn't want to give up his Ram truck, he said. “I need space so I can throw topsoil or whatever in the back of my pickup,” he said. Dodge, known for aggressive, male-oriented marketing, may be the perfect brand to break through to men, Gilles said. The minivan has a utilitarian nature that appeals to men and interior cargo space similar to that of a pickup, making it useful for camping and hunting trips, said Chrysler executives, including Todd Breneiser, a lead product planner. Before Gilles, 41, took charge of Chrysler's design and its Dodge brand, the designer spent his free time souping up his minivan and racing it on weekends. Klaus Busse, Chrysler's head of interior design, took inspiration from that and added larger wheels and a racing stripe to his minivan in 2008. It changed the driving experience for him and motivated him to make the minivan cool, he said. “It was amazing how many thumbs up I got,” he said.